A highly popular designer label, Fendi items are exclusive and expensive. Though Fendi makes a wide range of clothing items and accessories, it also designs and produces high-quality shoes. As designer items, it's no surprise that Fendi shoes cost quite a bit of money. In an attempt to cash in on that success, there are many fake Fendi shoes on the market. You can adeptly spot fake Fendi shoes if you pay close attention to detail. Examine the stitching on the shoes. Fendi shoes feature excellent craftsmanship. The stitching is even, sturdy and smooth. If the shoes in question feature crooked, uneven or sloppy stitching, they are likely fake. Look for any glue remnants. Replica designer shoes are often glued together, rather than truly stitched. While they may feature superficial stitching, fake Fendi shoes are often held together with glue. Feel the shoes. Fendi shoes are fashioned from high-quality leather, suede and fabrics. If the shoes' material feels flimsy, cheap or oddly stiff, they are likely not authentic Fendi shoes. Inspect any hardware on the shoes. If they feature buckles, buttons or clasps, they should look and feel high-quality. Fake Fendi shoes often feature cheap, bendable hardware. If the hardware has a Fendi logo, it should be engraved into it. If it appears to be printed onto it, the shoes are fake. Study the shoes' interior label. The text should be evenly spaced and clear. If it contains any misspellings or typos, the shoes are undoubtedly replicas. Likewise, the label's text should not appear sloppy or blurry. Compare a photo of the shoes for sale with a photo of authentic Fendi shoes. You can find clear, high-definition photos at Fendi's official website. If you notice any differences between the two photos, you can rest assured that the shoes in question are fake. 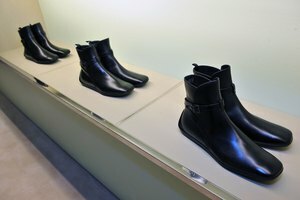 Buy Fendi shoes from reputable and authorized retailers to ensure they are authentic.